Little Jaxon will have his second birthday party tomorrow. Today I worked on one of his presents. 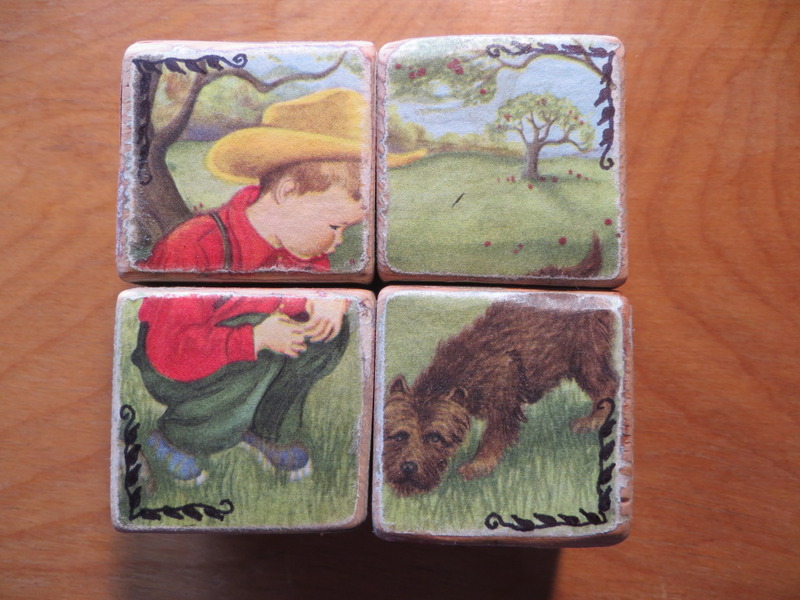 Puzzle blocks. They turned out so well, I have to share! I cruised through my stash of Little Golden Books… and I found Wiggles. Published in 1954. The book is older than I am! But it had a little blonde haired boy wandering in search of Wiggles. 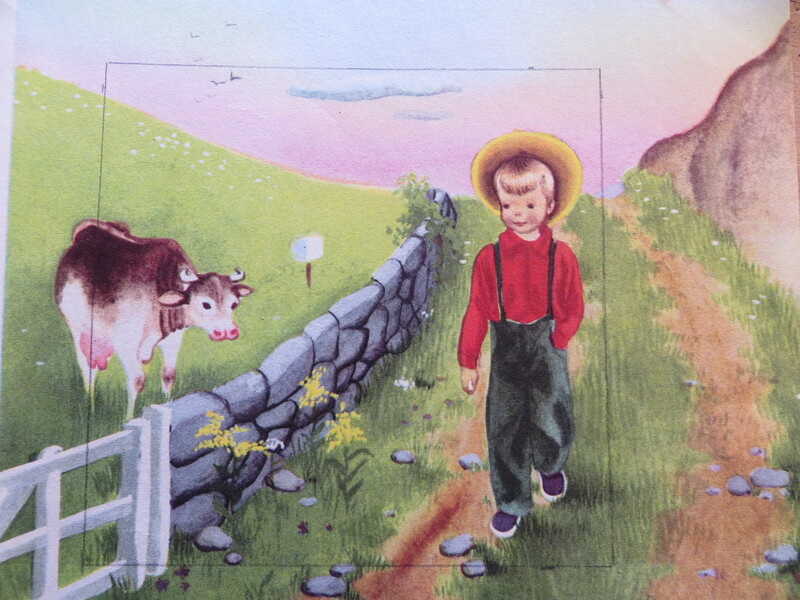 He doesn’t know who or what Wiggles is, but he searches the farm far and wide. I loved the pictures! 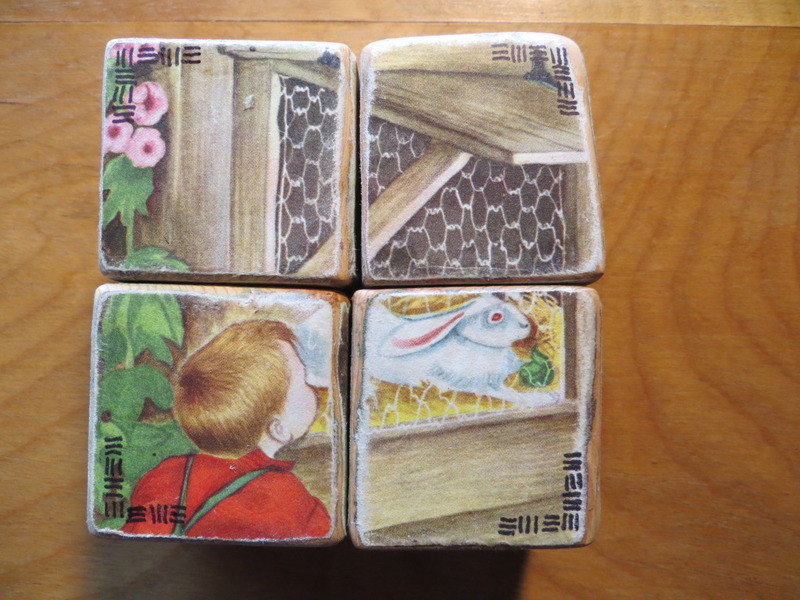 I went to my wood pile and found a 2″ x 2″. 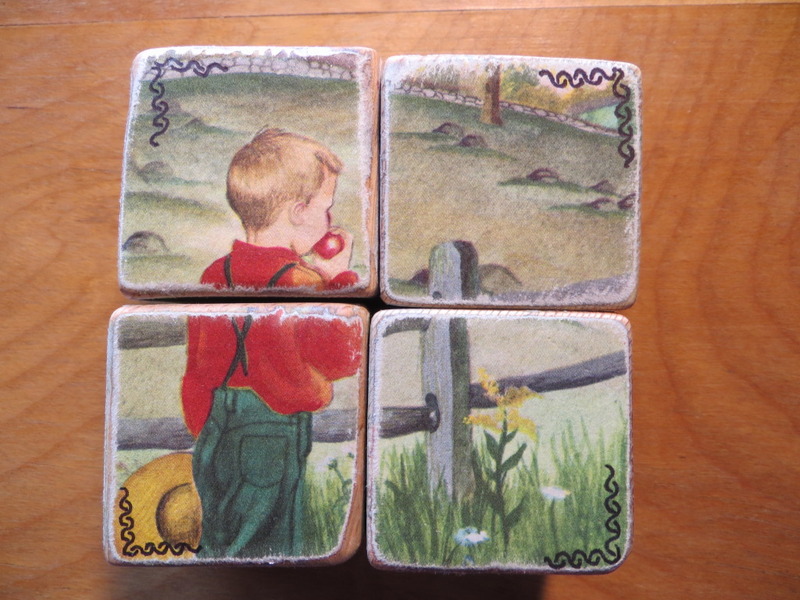 After sanding and cutting into blocks… and sanding some more, I was ready! As hard as it is to make yourself do it, rip the cover off the book. 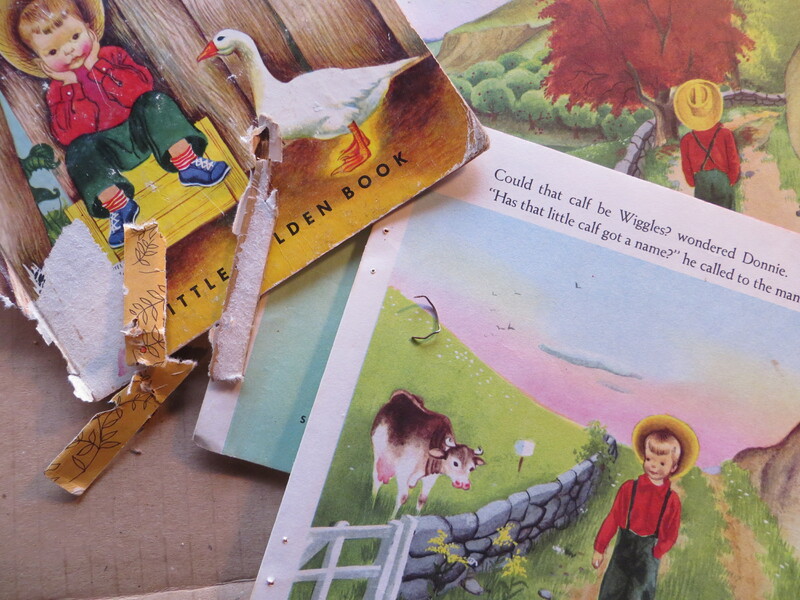 Little Golden Books are held together by a few staples, and it’s easier to cut your pages when they’re taken out whole. Make sure there are 6 good pictures you can use. Save the rest of the quaint images for some other project! Mark out a 4″ x 4″ square. This is a bit bigger than I needed probably by about 1/4″, that gave me room for adjustments. Wrap a rubber band around your four blocks just to help keep them in place as a single block. 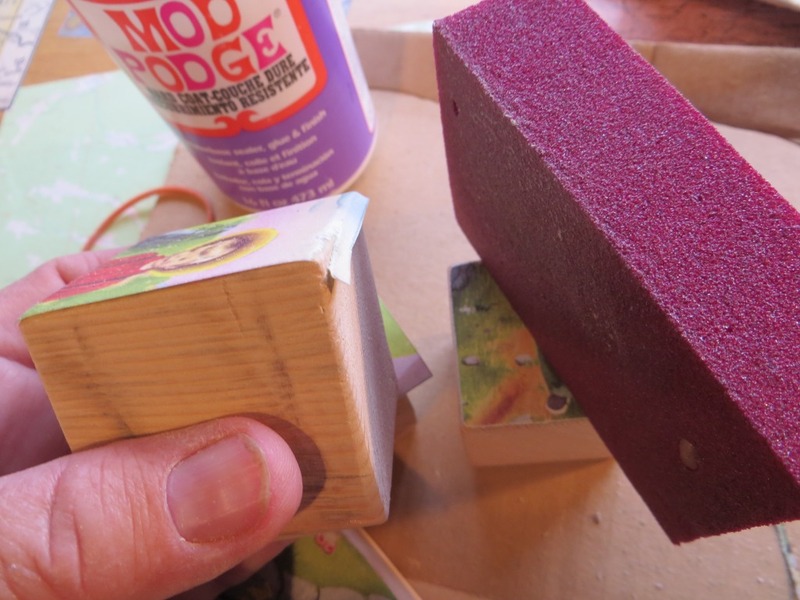 Figure out your placement, and coat your blocks with a generous amount of Mod Podge. Some will soak into the wood, and this old book paper is heavy. You can use less with well sanded blocks and newer, thinner paper. Immediately use a razor blade to cut the paper holding the four blocks together. Rubbing well by hand or using a brayer, secure the cut picture to the blocks. Next, sand the excess paper off. I’m going for the well worn look, so all edges are sanded down. I didn’t worry if my blocks weren’t exactly square, or the paper just so from the edge. I was NOT happy that I cut the cow’s face in half and I made sure on the following sides that critical parts weren’t split by the seams! I also went back and added little corner borders, each one different, but all placed on the outside corners of the blocks. It’s a clue to help put the pieces together! A few coats of Mod Podge to secure the paper and seal it, and they’re done! I think they turned out amazingly well! What a wonderful gift and idea. Thanks for sharing, will have to file this one away. What a great treasured present. Repurposing an old book makes it last longer. Those are really cute. However, I’m wondering why you didn’t just scan and color print the book pages, instead of having to destroy the book. Honestly, I did not think of it. I bought these books or saved them from the trash with the thought of making something from them. I love the heaviness of the paper, the thought that while some people will only see a ripped and colored in book and think only to pitch it away, that I’ve created a new life for it in the hands of a little boy that hopefully will treasure them, and hand them down perhaps to another generation. Lovely! What a wonderful present! And once again I’m in awe at your creative mind. Enviable. P.S. Thanks for all the photos of your beautiful land this past week. Made me yearn for another road trip. Fun! I’ll bet you could find (if you didn’t have a ready stash of kid’s books) some used books at thrift stores too. 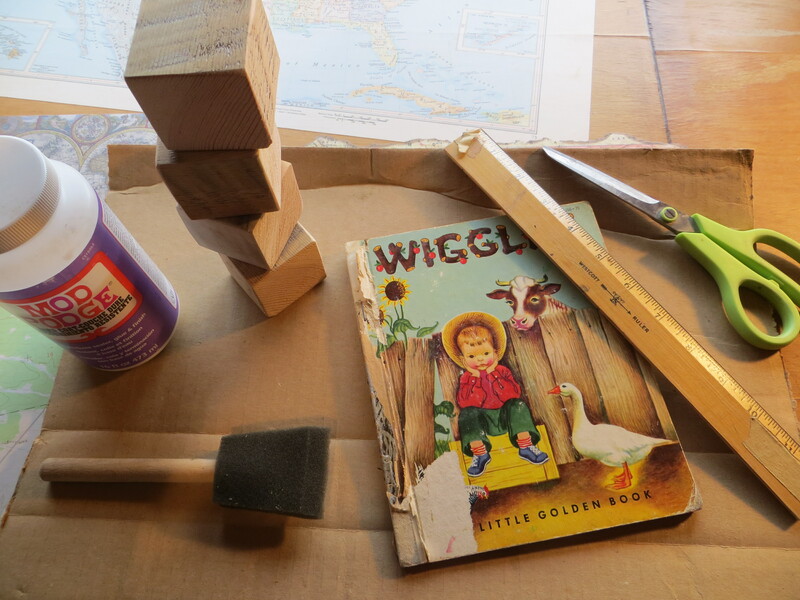 What a wonderful idea to re-purpose a Little Golden Book! 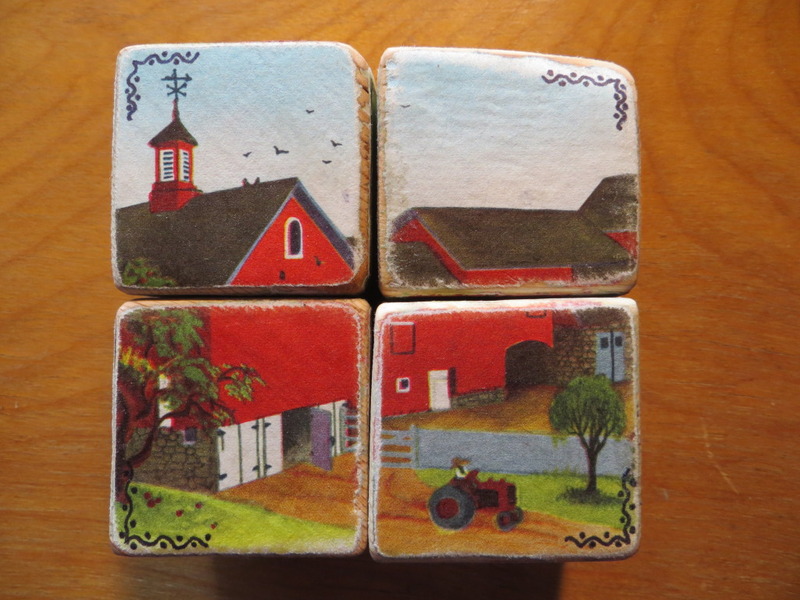 The blocks did turn out great…home-made and hand-made with love. Happy Birthday, Jaxon! What a great gift, made by GG! 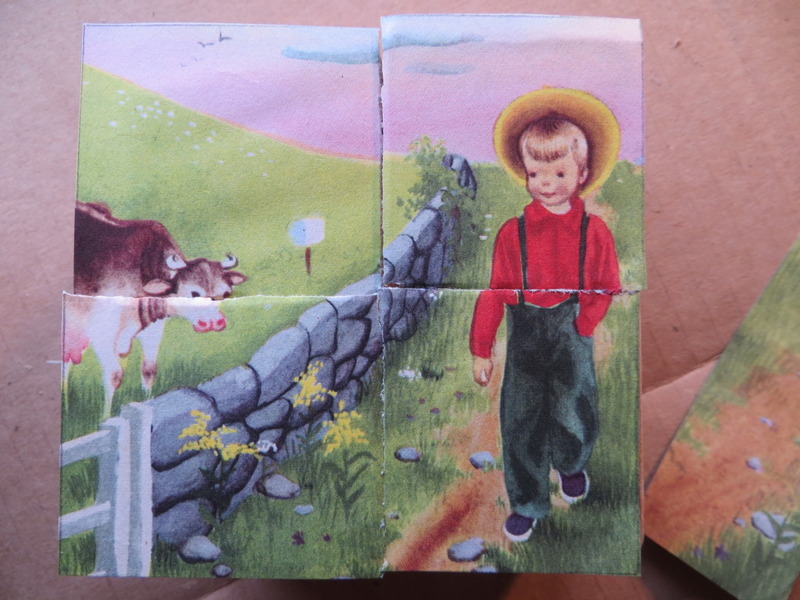 We are taking an on the floor puzzle to a three year old’s birthday party this afternoon, but not as clever or made by hand, or as treasureablle as something made with lots of love by a grandma! Adorable! Cutting into the book would be the hard part, for sure! Oh my. These are wonderful. 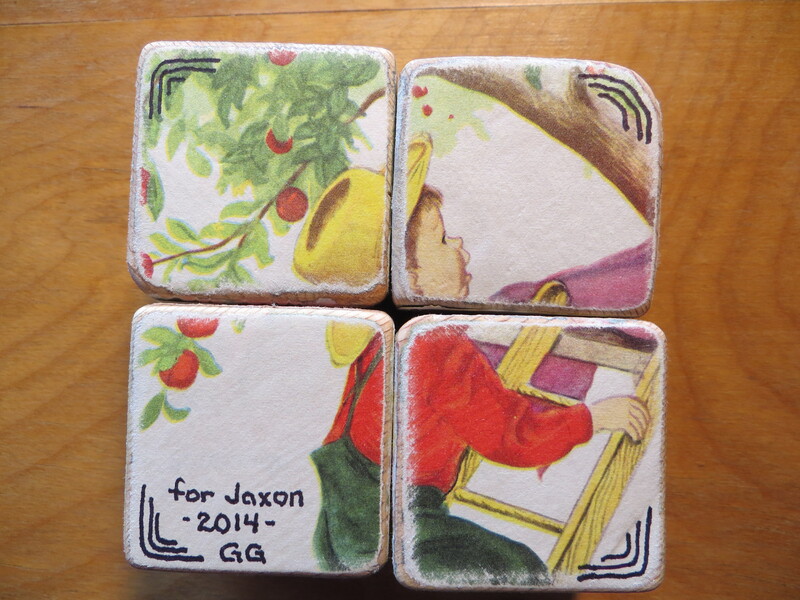 It must have given you lots of pleasure creating these blocks for Jaxson. He’s going to have a great Birthday. These are wonderful, Carol. 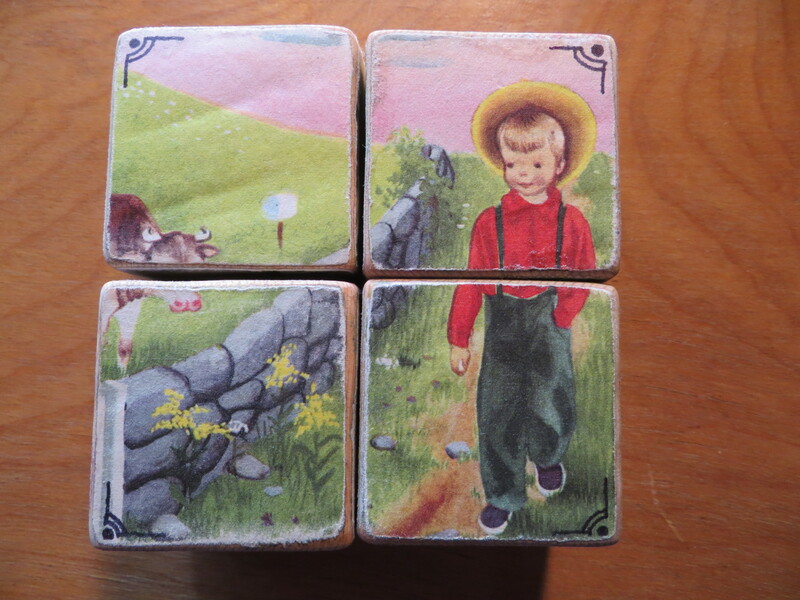 Those blocks say “love” all over them.